TORONTO, ON, August 22, 2018 –August marks the peak of hurricane season and the one-year anniversary of Hurricane Harvey’s devastation in Texas. On August 25, 2017, Hurricane Harvey became the first Category 3 or higher hurricane in the U.S. since Wilma hit Florida in October 2005. Category 4 hurricanes Irma and Maria followed Hurricane Harvey and were among many Atlantic hurricanes to cause widespread fatalities in the U.S. Winds during Hurricane Harvey reached upwards of 200km/hour. On Thursday August 23 at 10 a.m. Adrien Sparling, PhD student in Civil Engineering currently working in structural engineering with a focus on reinforced masonry construction at the Lassonde School of Engineering, will conduct tests to show how special walls can resist up to 180km/hour wind by testing their bending resistance. This research could change the way masonry walls are built around the world. Media are invited to attend the demonstration on two types of wall construction. Safety gear will be provided for those in the testing area and a safety zone will be set up for media who wish to watch the test without requiring all the safety gear. WHAT: Adrien Sparling and his team will conduct tests on a three-metre tall (1-storey) concrete block masonry wall. The wall is reinforced with two vertical steel reinforcing bars called rebar and partially filled with concrete. Horizontal force will be applied to the reinforced concrete block masonry wall using a large hydraulic actuator (piston). The wall in this test is expected to resist a bending force of around 20kNm. This is approximately equivalent, depending on the exact construction of the rest of the building, to a 180km/hour wind (very severe hurricane-force) on a typical nine-metre tall warehouse wall. The wall being tested is a “control” wall, constructed with conventional reinforcing techniques, with reinforcing steel bars placed in the middle of the wall. The results of the test will be compared to those of walls reinforced with an innovative near-surface mounted reinforcement technique. WHEN: Thursday August 23 Testing begins at 10 a.m. and continues to 2 p.m.
WHERE: High Bay Lab, at the Bergeron Centre for Engineering Excellence Room BCEE 010. See number 81 on the map. Adrien Sparling is available for media interviews in both English and French. The goal of the test is to determine how much the wall will deflect when subjected to a given amount of force as well as the maximum amount of force the wall can resist before breaking. 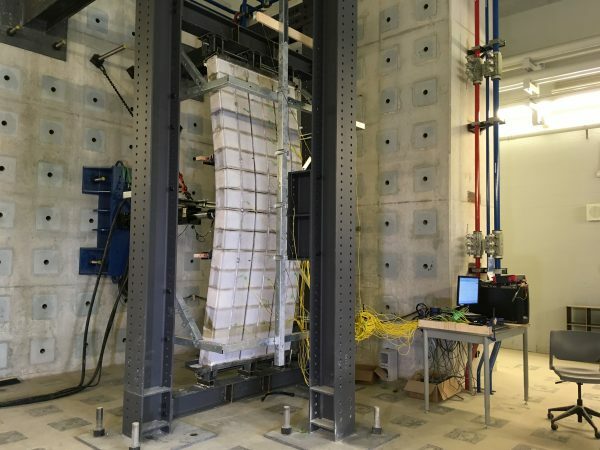 The series of tests Sparling’s team is performing this month is meant to compare how the different types of reinforced walls resist the applied forces like hurricane strength forces. Specifically, they will be comparing the conventional method of reinforcement, where steel reinforcing bars are placed near the middle of the wall, to near-surface mounted (NSM) reinforcement, where the same number of reinforcing bars are placed into grooves on the wall’s surface. Previous studies have shown that NSM reinforcement can allow masonry walls to resist high forces without deflecting as much as with conventional reinforcement.